George Potsidis – Geo Properties Inc.
George Potsidis is the president and founding partner of Geo Properties, with a specialty in real estate investment, restoration and development. His extensive knowledge of real estate is derived from a background of experience encompassing all sectors of real estate. 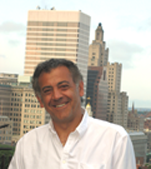 George holds a Civil Engineering Degree from Northeastern University and an MBA from Rensselaer Polytechnic Institute. Over the past 30 years, George has personally invested in the purchase and sale of over 40 properties. In 1991 he founded Sega Construction, Inc., a company that specializes in historic and environmentally sensitive restoration projects in Rhode Island and Massachusetts. Sega Construction’s distinguished restoration work has earned the company a reputation of excellence and it is highly regarded in the preservation community today. George is also president of the real estate development company, Seven Stone Building Group, best known for its award winning conversion of the Parkin Yarn Mill in Pawtucket into 25 artist and residential lofts. George currently resides in the East Side of Providence and is fluent in Greek, and is additionally proficient in Spanish and French.